1) Mini Brass Dinosaur Necklace - You'll, ah, recall my three inch, 3D, brass T-Rex necklace I got last year from ModCloth? Well, it has a baby now, a little one inch, flat dino. It isn't quite as exciting, but also not quite as . . . insane. I've worn it paired with another long necklace, and maybe if I pulled the chain a little smaller, I could wear it with its parent T-Rex? I tell you, it's one of the simple joys in life to pair a dinosaur necklace with a girly dress. 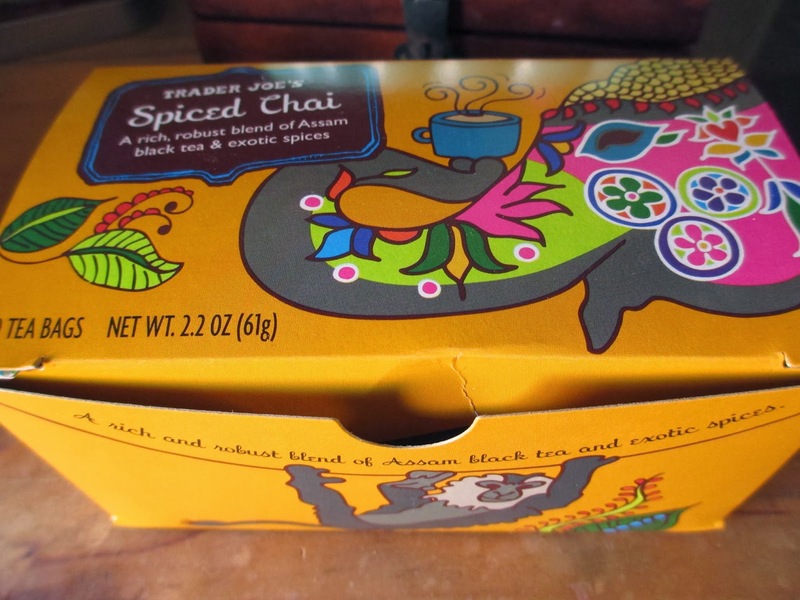 2) Trader Joe's chai tea - Someone needs to restrain me from buying more tea, especially from Trader Joe's. It's hard: they sell such inexpensive tea that I want to get it all "just to try it." A few months ago, I was craving chai tea and bought a tin of green chai tea--which didn't really satisfy my craving since it had a different, though still good, flavor profile. So now here we have a classic chai that just hits the spot. 3) Anna Sui Mini Coffret perfume set - Someone also needs to restrain me from acquiring little perfume bottles. Don't I already have enough? But sets are so tempting. This one has five mini perfumes from Anna Sui. I once had a sample of Fairy Dance and thought it had a nice smell to it, so I thought maybe I would want to buy a full-sized bottle from Anna Sui--that is, once I could bring home these mini bottles and decide which scent I liked best. But the thing is, I don't know how much I like the scents, after all. They're nice, floral and citrus or something like that; but then I lean over and smell Happ & Stahns Rose Alba or Tocca Florence and realize that I like those scents more. So I'm sticking with the little, pretty bottles for now. And why can't I have perfume just for looks? 4) Colorful Hearts - The Hummingbird House in Sedona often has these little hearts out, and they've been putting out plenty of red ones in preparation for Valentine's Day. The red is pretty, but the bowl of colorful hearts interested me more. Pale green accented by a touch of pink was the route I chose; I strung them on a random ribbon for display. 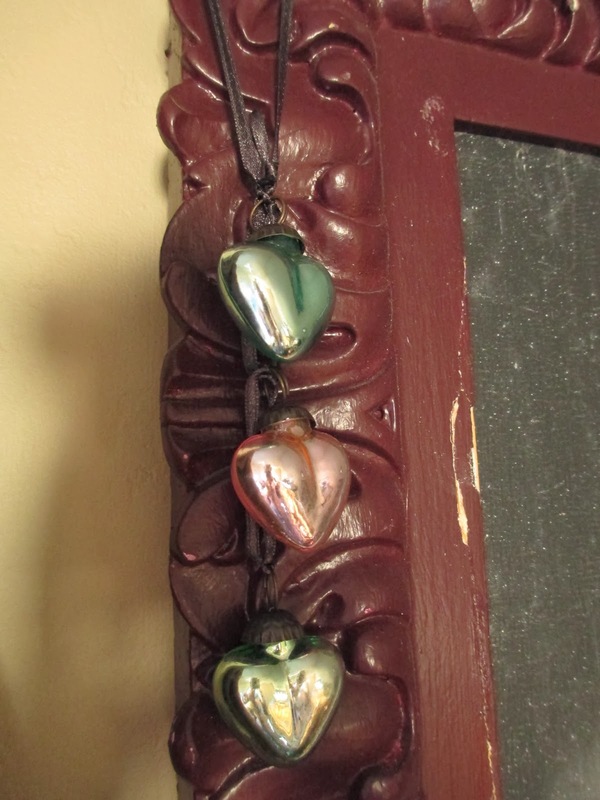 At two dollars for each heart, they're certainly a less expensive, but still pretty, item to choose from the enchanting store. 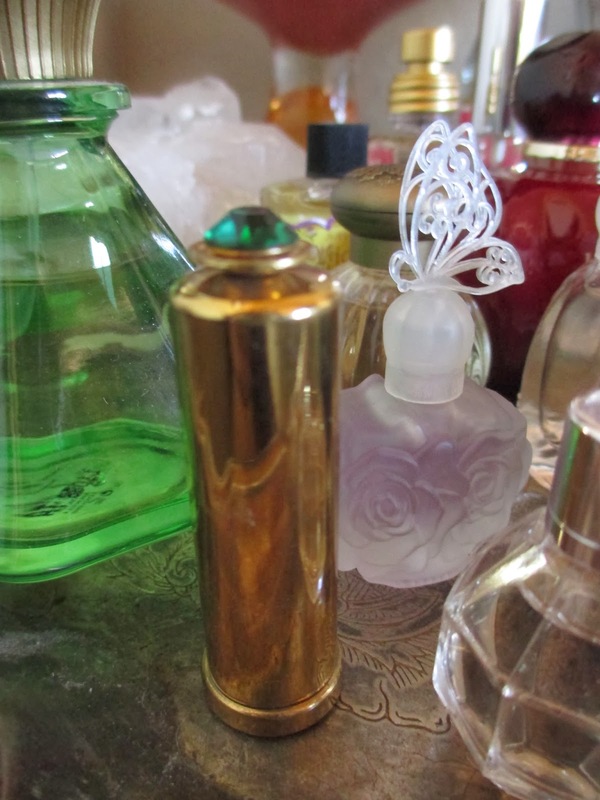 5) Vintage Brass Lipstick/Perfume Case - I thought this was an old lipstick case and thought to keep it in my vintage lipstick display. As it turns out, however, it was probably for solid perfume: it doesn't twist very much the way lipstick does. It doesn't really matter, but I can't think of it as lipstick anymore, so I've put it with my perfumes instead. The one green jewel on top suits me, don't you think? 6) The Lady of the Lake - I do believe the only work by Sir Walter Scott that I've read is Ivanhoe. Perhaps someday I will also read this long poem; I found it for a good deal at the same antique store as the perfume case, so I thought it might come along since it is pretty and Sir Walter Scott was cool. 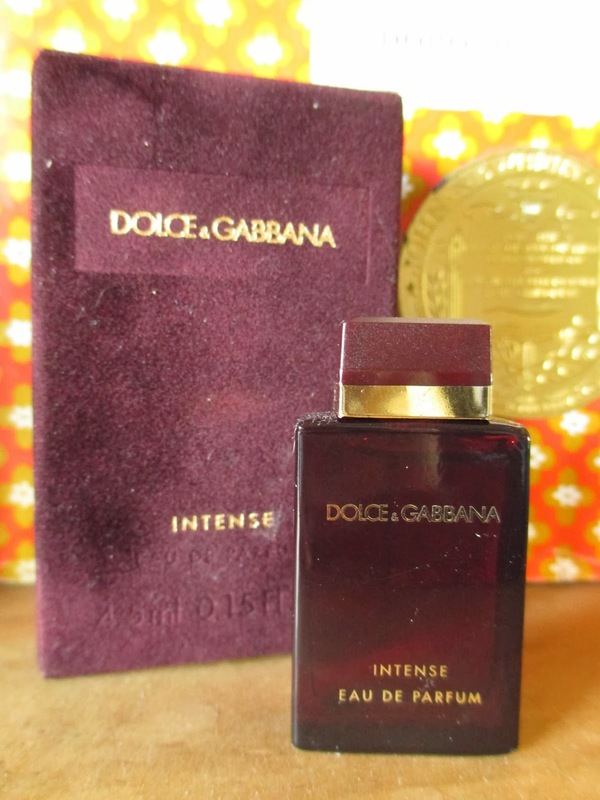 7) Dolce & Gabbana Intense Perfume - Gotta spend those Sephora points wisely, yes? I usually spend them on perfume bottles; I figure those are the less temporary items available. Although, unsurprisingly, I don't like this scent (it smells like perfume), the bottle is sleek and sophisticated and very welcome to my collection. 8) Wooden Alligator - Out of all the girly hats and jewelry and decorating items in this Prescott store, what I had to come out with was a reptile. I know, I'm crazy; I like being so. And the lizard likes to hang out around my perfumes; she's such a girly girl. 9) Green Wooden Hair Stick - There were two sizes of these, and I got the smaller size because of the tempting shade of green versus natural wood; given my rather long hair, the larger size would have been better. Yet the wavy shape of these really does help keep them in place: I can't get my hair to stay up at all with straight sticks. 10) Blue & Green Notebooks - Whether you want them to write in or just to have around, these have a classic look accented with pale color. 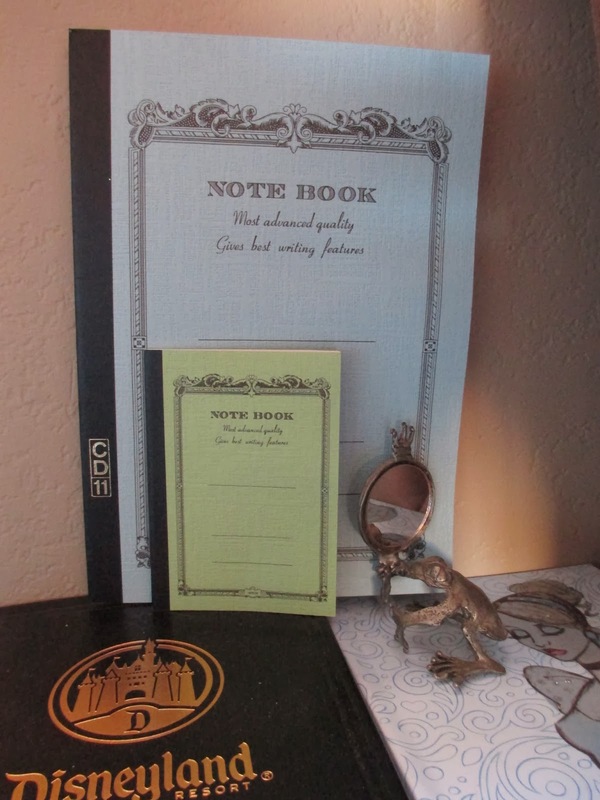 Maybe someone also needs to restrain me from getting more notebooks? Has it really been over four years since Flyleaf's album Memento Mori came out? Flyleaf, along with Emma Shapplin, has remained one of my most-played artists; their music speaks to me over and over again, and I am in turn constantly creating my response to it. Something recently put in mind the cover art for Memento Mori. I've always thought it had sort of odd imagery, but it is a rock band, after all. And I figured there was some sort of symbolic side to it, even if my own interpretation was only scratching the surface. The album title, you will recall, means "remember death" or "remember you will die." So when I went back to the digital album a couple days ago to look back at the cover art, I realized that the album contains the story of the songs. I must have assumed, four years ago, that the tiny words in the digital file were just the lyrics. The story is told in journal entries, written by a fictional character, describing a sort of symbolic-spiritual world that reminded me of C.S. Lewis's The Screwtape Letters. There is one entry for each song. So for every song, there is a complete story. While I had understood the gist of the songs, these stories helped to give even more depth to the lyrics I had heard time and time again. They also helped me understand that cover art better. I don't want to describe everything that is in the mini journal; I just wanted to make note of my discovery and pass it along to anyone else who overlooked it. Basically, the way the album text illuminates the songs is what I love about Flyleaf. I love the boldness; I love the artistry; I love the symbolic side. And I love the hope. At Kingston's Candy Co. in Ojai, where I found the Twenty-Four Blackbirds chocolate bar I enjoyed so much, I also came across some even more local findings. Ojai Chocolat, as you can tell, is straight from Ojai. While the packaging isn't particularly interesting, I was drawn in by the pattern of lavender that is on the chocolate. It has so much texture to it that it evokes both an organic, handmade look and grander artistry. I guess that made it worth my seven dollars. As described in the video interview on their website, this little company uses fair trade, organic cocoa beans that are not roasted; because all the temperatures are also kept under 150 degrees, this is also raw chocolate. But I've tasted chocolate that's kept under much lower temperatures than that--so I don't consider this "highly raw" chocolate. And however a chocolate arrives at the final product, I want that final product to taste good. Otherwise why bother? But there is a concept of healthfulness to this company, as you can see from the "no sugar, no dairy, no guilt" declarations on the label. The sweetener, by the way, is blue agave. I get all of this; I do. I just am always cautious that the declarations will overpower the quality of the product. Given, however, that this is such a beautiful chocolate, I don't think that that overpowering really happens here. Look at that glossy face. I don't feel like I'm looking at a bar of chocolate; I feel like it's a carefully crafted and carved wooden tile, stained to a dark glow. It's gorgeous. And as soon as you open the clear wrap, out comes the Lavender Mint scent. If I've had lavender and mint in chocolate together before, I don't remember the experience, but I find that the two harmonize quite well. Lavender already has a tang like mint does, so they make sense together. And while mint is a very common flavor for chocolate, lavender is still a bit less average. Both the lavender and peppermint come from essential oils, hence their powerful aroma. I started nibbling on the chocolate before learning about the 150 degree thing. Yet right away, I could tell that this chocolate was heated more than some that I've tasted. The texture, certainly, is different from regular chocolate, but it's still fairly cohesive and isn't crumbly or grainy. It's almost like very stiff fudge. So it doesn't melt as easily in your mouth as chocolate usually does; that's why nibbling on it is the best way to eat it, I think. Although at only 72% cocoa, it's quite dark and rich. I don't mean that it tastes bitter. On the contrary, the sweetener and the lavender and mint mask any bitterness that the chocolate may have had. But you only have to eat a little before you start getting a strong chocolate hit. If you want to start bouncing around the house, that's cool. Otherwise, you might like to saver this bar slowly. Raw factor aside (since it really isn't handled in a way that should scare you away with foreignness), this is nice chocolate. It has sort of an adult sweetness to it. It's the lavender and mint, I think, and the fact that the chocolate doesn't taste bitter. Given, this is still dark chocolate. So I'll let you decide whether or not it might be something you would find too dark. For me, it was at just the right level. Just take one last look at the back of the bar. Isn't it smooth? For something that's taken care to be raw, that's very smooth and pretty. So if you do like the standards of raw and no sugar and whatnot that Ojai Chocolat stands for, this is a good company to try out. And if you're simply searching for good chocolate, this is also a good product to explore. I would still tweak the packaging and labeling, but the chocolate itself I really enjoyed. Sorry, I've been tired lately, so every spare moment has been taken up in sleepily watching Lost (this, I might add, is my first time moving through the series). If this post is more delirious than usual, that is probably why. I just got this random idea to pair makeup and books, and so here it is. Note that I only used fiction and I only used a few makeup essentials, not every single thing I own. If I had my whole library with me, the pairings probably would have been different. But here is what I came up with based on what I have right now. 1) These are the lesser noticed base, the things that you yourself love but that are harder to talk about with others unless in very specific situations. Jane Eyre has become a part of who I am because I read it at a fairly young age, connected with it, and continue to revisit it and reconnect with it; but I usually only talk about it at length in literary contexts. Like this is my moisturizer, Tarte's Maracuja Oil; I love it dearly, but I only even found out how to pronounce its name after several months. 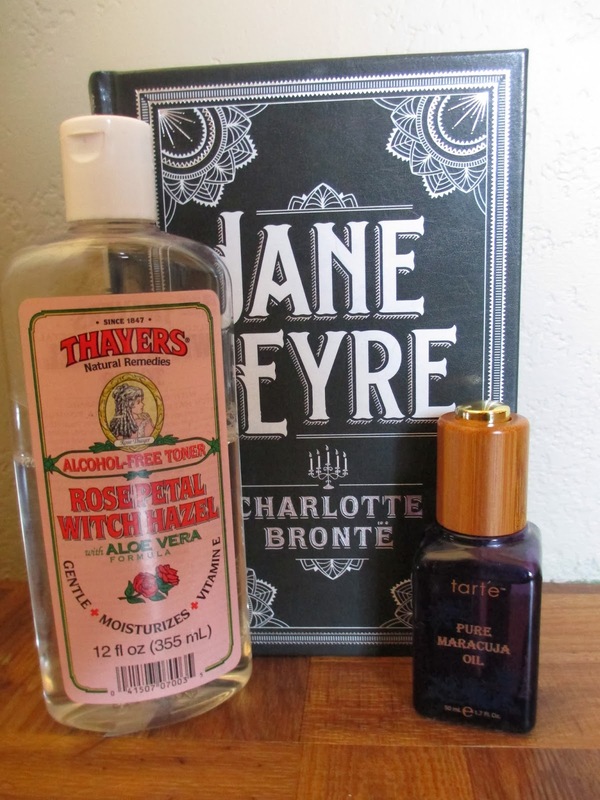 My Rose Petal and Witch Hazel toner from Thayer's is wonderful, but who wants to hear about a random product like that unless in a serious hippie beauty guru conversation? 2) Now here is the foundation. 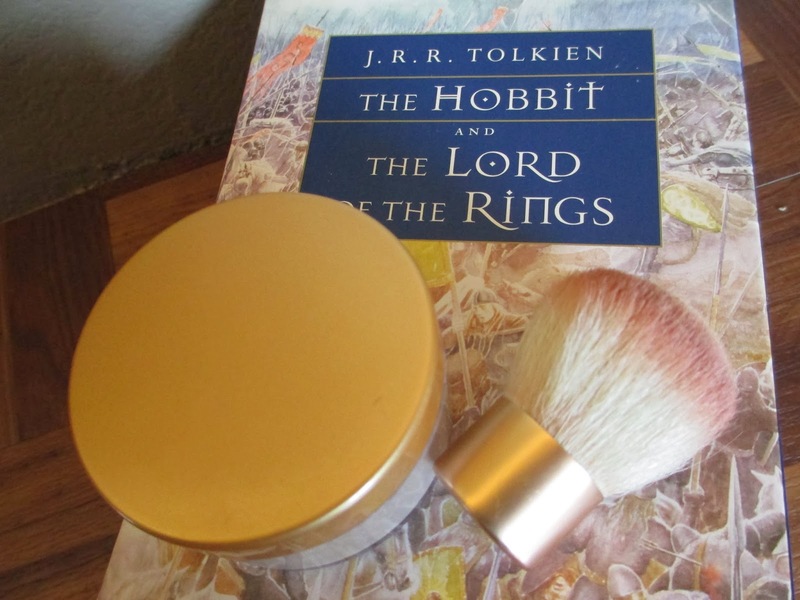 The literal foundation is a mineral powder from Merle Norman. I have had this very container for at least six or seven years; the words are nearly all worn away. Since I use very little of it, it suits me perfectly. Likewise a part of my daily life is The Lord of the Rings. This book contains ideas that are the foundation of many things fictional, fantastical, theoretical, and even ethical. No matter what topic you're going over, you can probably bring some Tolkien in for analogies or examples. 3) I interpreted blush as the soft warmth that affects the overall look. My usual blush is a tiny circle of Adventurous from Tarte; even though it was a small size included in a set, it's lasted me a long time because I only wear a touch of blush. I'm having Grace in Thine Eyes stand in for Liz Curtis Higgs; her books also have a warmth to them and there was a time when I would have easily named her as one of my favorite authors. Warmth, but also a bit of boldness. 4) Much more bold is eyeliner territory. This is where dark black stands in stark contrast to the rest: if you take out this one element, its absence is gapingly visible. I use Tarte's Skinny SmolderEyes in Onyx for below the eye and their MultiplEye Liquid Eyeliner for the top. 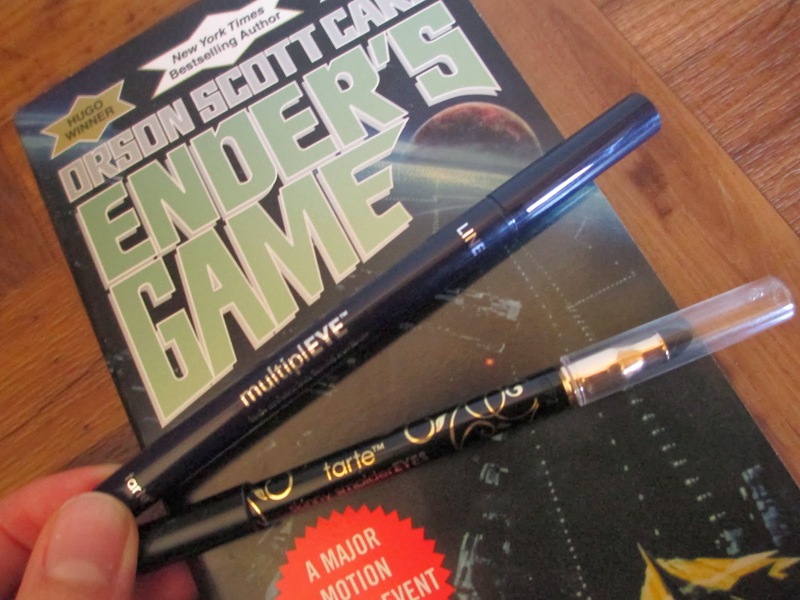 With them I paired Ender's Game: its dark, sci-fi cover stood out when I read it this last summer, but then I ended up really enjoying the book for itself and for what it brought to my collective literary experience. 5) Eyeshadow is the fun part, the crazy part, the colorful part. Sometimes I use more muted colors, but sometimes I might go for green or black or purple. It isn't necessary, but it makes everything lighter and more entertaining; it isn't for anyone else. It's just for me. 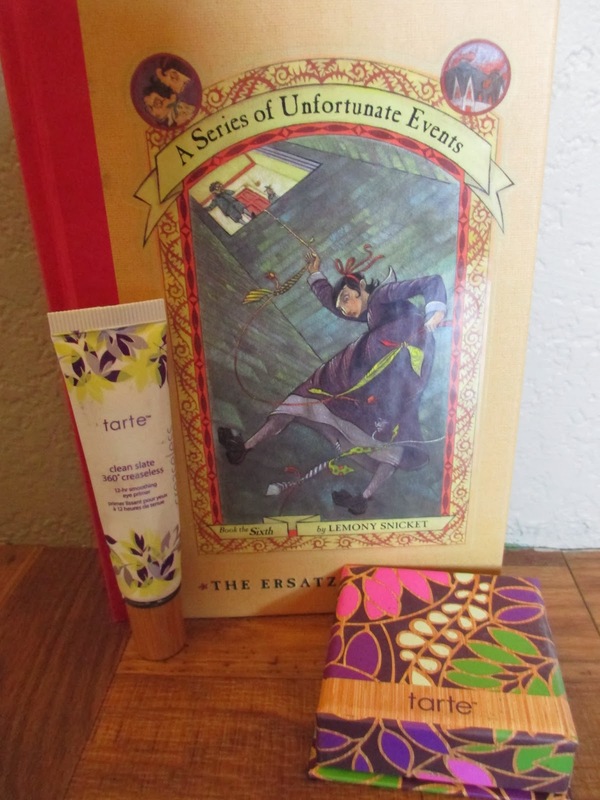 So with Tarte's eye primer and Beauty & the Box set in Brewed Awakening, I've placed A Series of Unfortunate Events. Basically I was going for the children's stories that we love also as adults, not just as children. The stories that will always make us smile. 6) Mascara, mascara, mascara--what is mascara? Depending on how you use it, it might just be an accent for your eyes or it might be a more pronounced blackness. Since I have long and full lashes to start with, I went for the more pronounced concept. Tarte's Lights, Camera, Flashes mascara and eyelash curler stand out in boldness against the cover of the much-talked-about Wuthering Heights. This is the book that is frightening in its boldness, the book that's been interpreted in a hundred different ways, the book that is very simple yet also somehow rather complicated. Either way you look at it, you can't ignore it. That sounds like mascara. Considering that I usually space out chocolate reviews, I will assure you that I am only going to give the barest hint of a chocolate review today: what I really want to relate is an entire experience. Most of us common folk don't often have the "complete culinary experience." A nice dinner might have an appetizer, entree, and dessert. But I don't think most of us, especially those of us who have chosen to live away from cities, often sit down for a long extent of time and make an entire evening out of dinner. And that's why I enjoy Pizzeria Bianco in Phoenix. It's by Downtown, right next to the Science Center. A cute little brick building with an almost completely glass front, it's always busy. Instantly busy. So you go in, give your name, and then hang out for an hour or two waiting for your table. There are seats outside, if you want to wait there when the weather's nice. But there's also a next-door building with additional tables where you can order drinks and appetizers; they let you know there when your table's ready in the restaurant. Usually there's someone there with a guitar, singing and playing. A charming building, it has small rooms, mismatched tables, and pictures on the walls. House of Tricks in Tempe could be its cousin. Both times I've gone, we've ordered the cheese plate and some wine. For once, you have the chance to sit, unhindered, and just be. Conversation, music, and simple, fine food put together in a quiet environment make for a relaxing start to the evening. There are always three types of cheeses, along with a few other items, and I always enjoy seeing which flavors each person likes best. When time has passed, you slip over next door to your waiting table. Start with iced tea and a salad and place your pizza order. Order as a group so that you can taste more than one. Then sit and watch as, just over the low brick wall, they pull the pizzas in and out of the oven. The atmosphere here is more vivid, less lazy than next door: next door was fun, but this is what everyone came for. Everyone came for the much lauded, much praised pizzas of Pizzeria Bianco. The crust is rustic, a little toasty on the outside but soft and chewy on the inside. I proclaim each time, much to the surprise of my groupies, that I still prefer the crust at Bill's Pizza in Prescott (it's almost sweet somehow), but there's still no denying that Bianco's has a good dough. All their ingredients are amazing. Their sauce is fresh and sprightly; you can taste it especially in the pizza that has no cheese or in the basic Margherita pizza. We ordered one pizza per person and moved them around the table, switching and switching them until we'd tried them all. This last time, we shared a flourless chocolate cake for dessert. I have mentioned before, right, that I make flourless chocolate cake? It's quite easy, really, provided you're using good chocolate (and I mean good chocolate). So it's difficult for me to go to restaurants and have flourless chocolate cake that isn't as good as mine. But goodness, I believe Pizzeria Bianco makes the best flourless chocolate cake I have yet had the pleasure to taste. While others are good, this one was perfect. I think it raised my opinion of the entire restaurant by a few notches. Perfect texture and flavor provided a complete chocolate experience; I don't say that lightly. I finished with an espresso, just a taste of strong coffee to bring the experience back down to earth. A walk out through the cold night, a glance at the watch to see how many hours have passed since you arrived, and there is the experience of Pizzeria Bianco. Was it already so many months ago that I first tried the Truffle Fudge Bars from John Kelly Chocolates? That first one was plain chocolate, brought to me from Santa Fe. This one is the Espresso version; I found it at Kingston Candy Co. in Ojai, CA. I guess my first John Kelly review wasn't one hundred percent flattering, but somehow it felt like I had to get another fudge bar when faced with a shelf of them at the candy store. In that setting, the shiny gold wrappers did indeed look inviting. I forgot the negative side of my original criticism and snapped up one of the little bars. A December trip from California was more forgiving than a summer trip from New Mexico: the chocolate's surface is unblemished. And, in fact, the swirl design is much prettier to begin with on this bar than on the other one. But once I bit in, I remembered why I had mixed comments before. I tasted fresh and strong espresso, but I also tasted a mediocre chocolate shell and something not quite right in the composition of it all. That would be the palm kernel and palm oil, I presume. And it's really rather annoying. The idea of truffle fudge is good, what with its meeting point of rustic and couture. But I wish it were carried out just slightly differently. I still find those rich, red chocolate notes I mentioned before, but I can't focus on them because I'm just tasting something oily and a tad too sweet. Should I really be finding something too sweet calls itself Dark Chocolate Espresso? Perhaps if we compare to a frothy Starbucks drink instead of a tiny cup of deadly-dark espresso? I want to keep eating because I want to like it, but I don't want to taste more of that oily-sweet brownie-ness. I almost might as well have bought a Sky Bar or ten more packs of Smarties instead. I must reign myself in just slightly: if your palate is different from mine, you may even love this truffle fudge. If you haven't spent as much time around eight dollar bars of plain chocolate or don't really enjoy chocolate with a high cocoa content or simply love rich, fudge texture, maybe try this one out. It straddles the line between grown-up and young chocolate. Click here to read my thoughts on Frozen. You know how we all end up with random childhood memories? Well, one of mine was from a video my second grade class watched. I always thought it had to do with a museum and that the story was part of mythology or something like that. The camera showed spiky ice, and the narrator described something about a child's heart being pierced by ice. Very random. But after watching Frozen, I wondered if this video might have been describing something from the Hans Christian Anderson tale, "The Snow Queen," on which the movie was partially based. Frozen had no more similarity to "The Snow Queen" than The Little Mermaid had to its own Anderson story. But that's beside the point: the interesting thing is to see what the Frozen team did keep from the old tale. I had to pick up my Hans Christian Anderson volume since I had no memory of reading "The Snow Queen." While the story begins with a mirror, there is no mirror in the movie--unless you count the theme of personal image that exists within both sisters' journeys. The story has a boy and a girl as main characters instead of two sisters; one of these sisters is the Snow Queen herself, instead of having her as a separate character. What's notable about this is what I think of as the Harry Potter or X-Men effect: the instance of having something within yourself that you can either use for good or for ill. Usually it's something that general society doesn't look well on. This very modern theme is one of the reasons I called Frozen a modern fairy tale. They didn't make the Snow Queen a force of nature or a witch or anything like that: she's a person, who happens to be able to shoot ice from her palms. Let's just skip over the flower garden portion of Anderson's tale, shall we? The prince and the princess find their way, vaguely, into the movie in the form of Anna's quest to find love. Sadly, I don't remember any crows in the movie, although there was one very cute reindeer. In place of the robbers I suppose you might say stands Kristoff--he adds a similar rustic quality. And there's a good amount of traveling in both movie and story, though not of like distances. Obviously, the main similarity is the ice freezing someone's heart. In the story it's a child, Kay, and his innocence is a central element. While Anna is no longer quite a child, she is young and still carries a certain purity about her. It's this purity that allows her to be fooled into false love. The melting of the ice also happens very similarly. It's done in both cases by a female character--with no romance involved. (We might assume that Kay and Gerda will fall in love as adults, but throughout the body of the story we're told they're children.) Gerda the friend and Elsa the sister melt the ice through sorrow, born of love, over their dear one's pain. Naturally, Anderson pushes the purity side of love more than the movie does, but still love stands at the center. 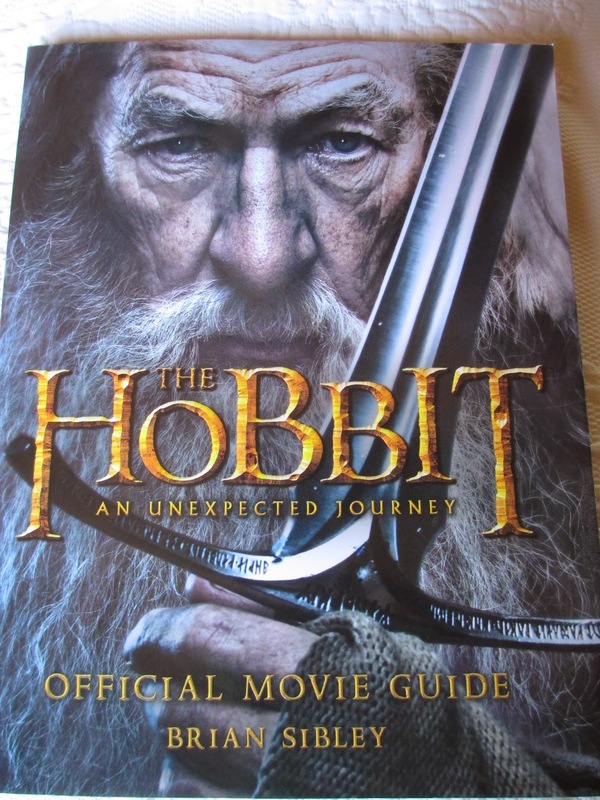 As I finally move into the movie guide for The Desolation of Smaug, I also move into greater details. While there are many new things that we saw in the second movie that weren't in the first (Beorn, the spiders and elves in Mirkwood, Lake-town, and Smaug), there are certain factors that are the same. It's still the same director, same team, same principal actors--and these already had some page time in the first movie guide. So this time there was the chance to delve into smaller details. I love reading about food, so the section on Food Stylist Debbie Logan was one of my favorites: this is an area of movie-making that's intriguing, but that you hear extremely little about. In addition to the sections that cover props making, makeup, and set design, there are also small boxes inserted into other sections; these might describe something like the making of a particular prop. And everywhere, once again, Brian Sibley's text only accents and puts into context quotes from quite a number of the cast and crew. Reading this book ended up similar to watching a series of interviews in a making of video, and that's exactly what I like to have in a movie companion. Somehow this one felt longer than the first companion, even though it's about the same length. But I think this was because the sections are longer in this book; instead of many being two pages, most are four pages. That means that the format wasn't as uber-tidy as it was in the first companion--but it's still pretty much average for a companion book. 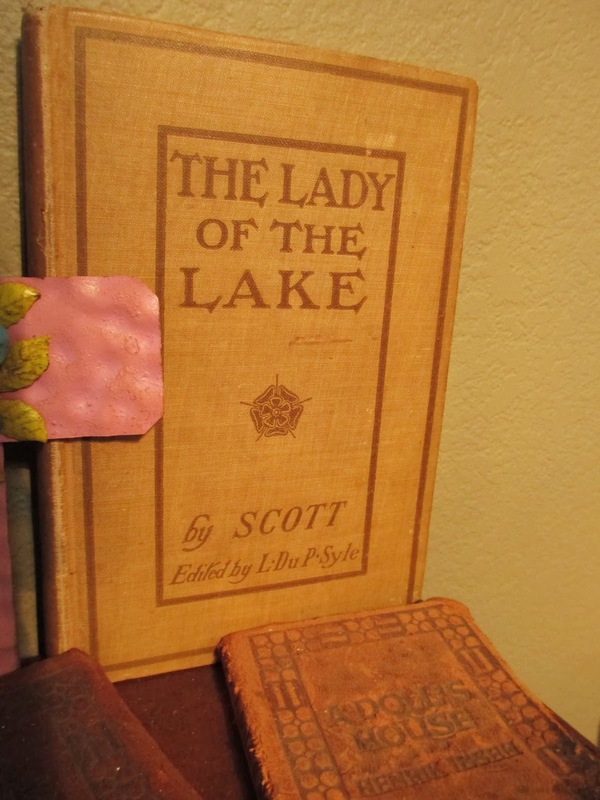 One of my other favorite parts was anything to do with Lake-town, including the costumes, props, and set. After watching the movie, I was trying to guess what the cultural inspiration was for Lake-town, but I kept on feeling like I wasn't naming the right thing. And then along comes this book, describing that that's exactly how everyone wanted it to be: they drew from so many sources that they wanted Lake-town to be inspired by those sources but not 100% identifiable with them. So while it will probably be better to watch the DVD material to learn about the making of Smaug, Lake-town really stood out in this book. What an amazing feat that place was. Click here to read my post about the Chocolats du Cali Bressan shop. As I explained before, I ended up with a chocolate candle from Jean-Michel Carre's chocolate shop in Santa Barbara. This candle, however, is from a different brand. But I seem to have fallen greatly from my "professional" chocolate reviewing days: I can't find the tag that came on the candle. Whatever could I have done with it? The problem, I suspect, is simply that there have been so many Christmas candies floating around, with their packaging and labels, that I haven't kept it all organized enough. It's ridiculous, really, that I can't find the tag. Rather than waiting until it turns up, I will continue, anyway. I suspect that the company behind this candle is Wine Country Chocolates, based out of Sonoma, California--but I can't be sure without that tag. As you can see, the candle comes in plain, clear glass in a rectangular shape with rounded corners. The lid is dark wood that simply lifts on and off; Cali Bressan has added one of their stickers to the side, which I find rather handy as a hinge. This way you can take the lid off to use the candle without actually needing to set it aside: it just hangs there, ready to place on top again once the candle is off. Since they added their sticker, I'm unsure whether or not the bow is original. I tend to think that it is since the brown with pink polka dots isn't entirely consistent with the sleeker, black and red look of Cali Bressan. Either way, the candle looks inviting and pretty. The wax is a a golden brown color and smells fragrant like sweet and rich chocolate confections. When I first lit the candle, I was disappointed. I wanted to instantly smell waves of chocolate, like with the Chocolate Truffle candle from Root (you can read that post here). Instead, I got almost nothing; putting my face right next to the candle, I only received a barely imperceptible chocolate-inspired scent. I dismissed it as an overly-sophisticated candle that leaned too far away from cloying chocolate scents. But then I let the flame continue to burn. With time, my room did smell faintly like chocolate syrup. Now when I turn the candle on again, it seems to have scent much more quickly than it did that first time. It's still not quite so absorbing as the Root candle was, but I think that does make it a little more sophisticated. (Don't get me wrong, I still remember that candle very fondly, this is just a different style.) If you want chocolate in the air, but not clouds of it, this candle will do nicely. And it is a more pure-burning type of candle; before I misplaced the tag, I did notice that it was soy-based or some such thing. Let's just say it's different from the candles at Wal-Mart. But why, might I ask, is my lovely chocolate candle nearly gone now? 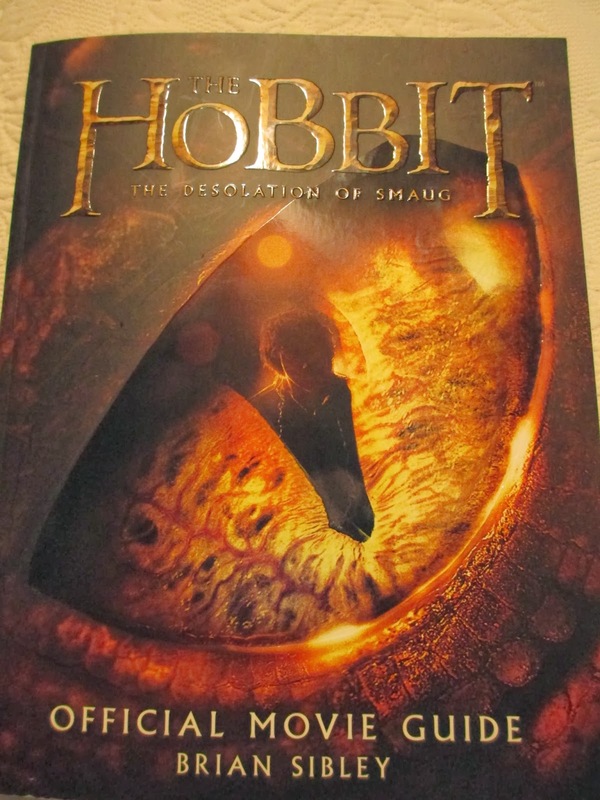 Click to read my initial thoughts on: An Unexpected Journey and The Desolation of Smaug. The problem is, when I purchased the movie guide for The Hobbit: An Unexpected Journey, I was in the middle of my senior year of college and I just couldn't find the time to sit down and read it, page per page. So it sat, sadly, on my shelf (figuratively, since I don't keep my books on shelves) for months. I have since also acquired the companion for The Desolation of Smaug and the three Chronicles books from Weta. I'll be moving into all of those next. After flipping through those immensely detailed Chronicles books, the movie guide seemed hardly to have time to go into any detail. It's only regular length at about 170 pages, yet it covers so many different aspects of how the movie was made. The Contents lists about 52 different sections; that means that many of them are only a couple of pages long. And yet Brian Sibley makes it all work so well. The short sections make the book easy to read, if you want to sit for a few hours or only read a few pages at a time. As I always hope to find, the pictures flow well with the text so that you don't have to flip back and forth or pause in the middle of a paragraph to look at a picture. But the content itself is also well-organized. There is very little plot summary, very much of quotes from cast and crew, and details on both the more expected aspects (like wardrobe) and the less expected. I really enjoyed, for instance, learning about what Terry Notary does as the movement choreography and about Amy Wright's field as a breakdown artist. Interestingly, the character sections (on Dori or Nori or Radagast, etc.) are interspersed among the other sections. So you don't have to read all of the character material at once, or all the costume material, or all the digital material. It's arranged so that you have a large amount of information in front of you, but it doesn't seem overwhelming. And the usual mix of still photos, behind the scenes picture, and concept art are all wonderful to have. I think I'll move on to the Desolation of Smaug companion before I dig into more detail in the Chronicles books. It's rare to find a non-chocolate company providing a chocolate of true quality from a partnership (or whatever you would call it) with a separate, chocolate company. 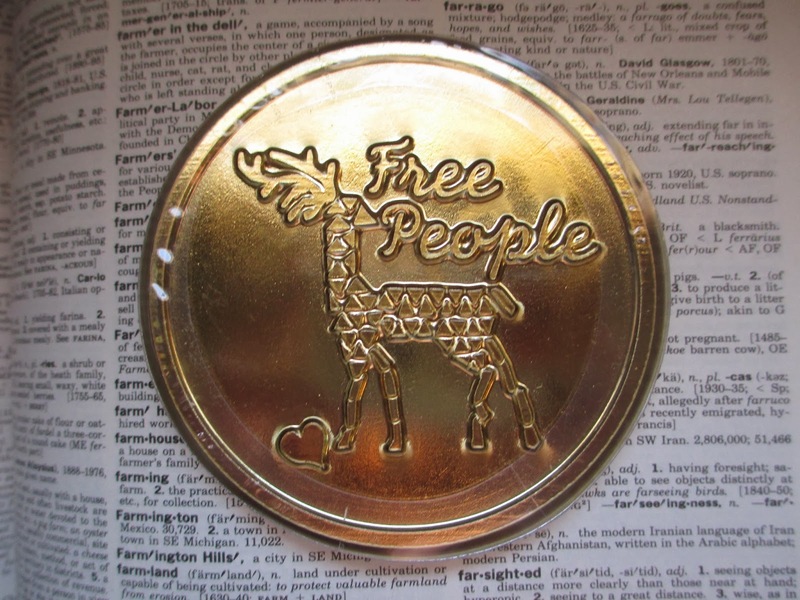 So even though Free People is, while not a designer brand, a step above certain other clothing stores, I wasn't expecting much from the Christmas coin they had for sale this past season. But it's pretty, so I wanted it. Naturally. The coin is not foil-wrapped; instead, it it two sides of gold, plasticy material. This makes it easy to open and to close up again. 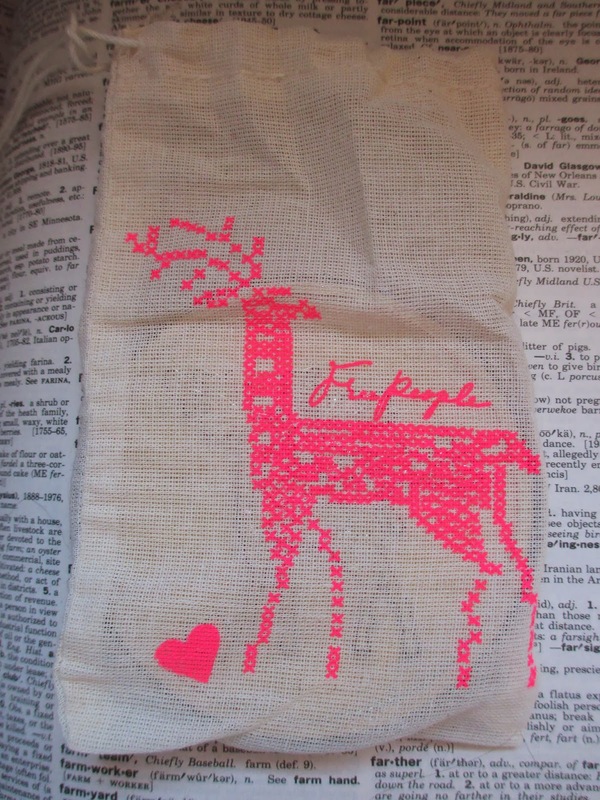 The whole coin, when you buy it, sits inside a a cloth bag with the same reindeer design (in pink) that is on the coin. I'm using this bag to store my Christmas star for my small tree. One third time, the reindeer appears on the face of the coin; it's really a charming little design. It blends well with the look of Free People's store and clothing. Now, it's true that there are worse brands to partner with than DeBrand Fine Chocolates; Free People could have done worse. But the thing about companies like DeBrand is that they produce a large quantity of chocolate, and when you're doing that, the type of quality is different from what other, smaller companies can provide (if they choose that attention to detail, that is). So this 40 gram coin has a very standard milk chocolate aroma. It barely smells different from Hershey's. There is a little more to the flavor, fortunately. In addition to the nutty notes, there is an almost smokey flavor, which is rather unusual for a milk chocolate. At least there are no oils added to the mix: this isn't overly greasy chocolate. It melts cooly and smoothly, a cleaner type of milk chocolate. So I can't say that it's terrible junk. It isn't. It's okay; I'm eating it. But the best thing about this chocolate remains its origin: the shelves of Free People. I and, I imagine, everyone else bought it for looks. 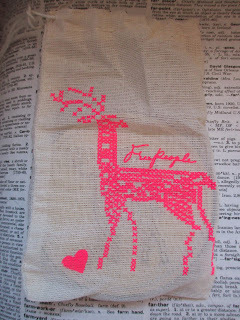 It's been decorating the space by my jewelry for a couple of weeks and the bag will decorate my Christmas storage box for much longer than that--certainly much longer than the memory of the chocolate will last. What's this? It isn't until the fourth of the New Year that I finally bring myself to post? Why could that be? Well, I've been busy writing and working and cleaning and shopping and eating candy--and on New Year's Day itself I was busy sleeping and watching TV. It has always seemed strange to me that we await the New Year with such anticipation, but then turn sluggish once it actually arrives. Does that perhaps speak greater meaning? Whether or not we go to a New Year's Eve party or other event, we stay up, we count down the last seconds, and we get excited over the whole affair. If you are at a big event, you might stay up celebrating a little past midnight. But for most of us, midnight means it's time to start winding down and finally go to bed. And even though I found myself waking up early enough for the Rose Parade the next morning, my eyes were dropping by the time it ended; nap time it was. So after being so excited for 2014, all I could do when it came was sleep. What a greeting for a new year. But, you know, New Year's Day is, after all, only one day of the year. Even if we sleep through the whole entire day, there is still a full year of 2014 ahead. And after a while, once we stop writing 2013 on all our papers, every day is very much like any other. It's the transition we want to witness; it isn't that 2014 is so much more special than any other year that we await it so expectantly. Except for the year it turned into 2000--that was more of an event. And I think it might also have been the first year I stayed up until midnight. Possibly.